Elvis Andrus has taken his fair share of heat from Rangers fans and from media alike over the past couple of years since signing a big extension and somehow regressing as a player in his mid-20s. It's been really odd. But over the past month, Andrus is starting to turn around his play and play like a shortstop making nearly $15 million per year. We're not saying he's worth it yet, as he's going to have put together seasons like this past month, but the signs have been good. Andrus is batting .310 with a .351 on-base percentage over his last 23 games. In that time, he has seven doubles and a home run and is near the team lead in RBIs with 11 during that 30-day span. But here's the thing, he's getting better. Over his past six games, in particular, Andrus has four of those seven doubles and that lone home run. He's hitting the ball hard — harder than perhaps he ever has in a stretch of his career. He's also been tremendous recently in the field. In his last 34 games, he has four errors and he's starting to make his signature highlight reel plays at shortstop more routine. 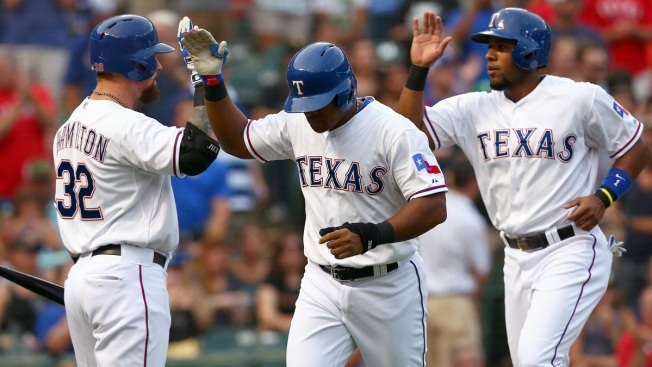 With Prince Fielder and Rougned Odor in slumps after carrying the team through June and July, other players are stepping up and keeping the offense alive, and one of the main culprits has been Andrus. Can we say he's turned things back around for the better? No, not yet, but the last month is worth getting a little excited about.